Looking for discounts? Get free Syberplace coupons and deals to save up to 75%. Click to activate the code and start saving now!!! Now grab 31% discount on Lenovo Vibe Shot that comes with 5 inch LCD capacitive display, 3GB RAM, Octa Core Processor and many other features and get 31% off. Buy Lenovo A7000 that comes with Octa Core Processor, 5.5 inch HD display, 2GB RAM and 8GB internal memory and enjoy 30% off. Order Samsung Galaxy J5 with 5 inch HD screen and 1.5GB RAM,8GB internal memory and Quad Core Processor and take 33% discount on your purchase. Order Apple iPhone 5S with 4 inch display, 16 GB storage, 4G enabled and up to 8 hours talktime and grab 43% off and get it at just ₹20481. Buy Apple iPhone SE phone with 16GB memory available at just ₹34999 only. Grab the offer while it lasts. Buy best selling mobile phones and get up to 40% off on various brands like Samsung, HTC, Micromax, Apple, LG and many more. No coupon required. Don't miss these best deals and offers in mobiles. Buy latest laptops online with flat 5% discount. Shop laptops from top brands like Lenovo, Dell, HP, Asus, Acer, Apple, Microsoft and more. No coupon code required. Hurry!! Get up to 20% on power banks. Designed with a built-in efficient cable, this amazing power bank can conveniently charge your smartphone anytime and anywhere. Shop now and grab the awesome offer. Shop any products from the website and take away extra 1% discount on payments via PayUmoney. Make the most of this offer as this for limited time period. Hurry up!! Shop now for the HTC One Me (Grey) phone at Syberplace store and get at just Rs.34999. No syberplace coupon required. Grab it today. Mobile covers protect the back side of your phone from scraps, dust and bumps. Shop now for latest collection of mobile covers get flat 15% off. No need of any additional coupon codes to avail this offer. Order now!! Grab up to 45% discount on Blackberry mobile phone such as Blackberry Z10 Black, Blackberry Porsche design p9983, Blackberry classic Black and much more. Hurry up! Grab up now. Enjoy up to 34% discount on Micromax phone tablets such as Micromax fantabulet f666 GB wi-fi+3G, canvas tabby p469 family, canvas tab P680 16GB and much more. Hurry up! Enjoy the deal. Save up to 49% on Apple Iphone such as Apple Iphone Apple Iphone 4s-8GB White, 6-128GB, 6-64GB Gold and more. Hurry up! Save now. Grab Asus Zenfone 2 ZE551ML 4GB (Silver) for Rs.17,999. No voucher code is required. Hurry! Avail this offer now! 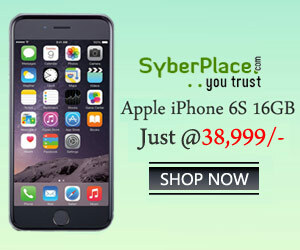 Buy Apple iPhone 5S-16GB (Space Grey) at Rs.16,999 only from Syberplace. Limited period only. Make the most of this grey Apple iPhone 6 – 64GB as it comes with innovative features. Buy at Rs.39,999 only. Valid till stock lasts. Shop online for Samsung Galaxy J7 (Black) at Rs.12,999 only from Syberplace. Grab it now! Get your hands on Samsung Galaxy A8 ultra-slim full metal body for a truly exceptional grip, buy it for Rs.23,812. It comes with 4G,sAMOLED 5.7 Inch display, and more features. Buy Micromax Canvas Juice 3 Q392 (Grey) 8GB 3G smartphone with 1 year manufacturer warranty at Rs.5,999 from Syberplace. Buy now! Grab Samsung Galaxy J5 (White) at Rs.9,999 only. This stylish Samsung Galaxy J5 4G enabled smartphone that features gorgeous slim body design, 4G LTE connectivity, 5" HD Super AMOLED display, 13MP primary camera, 5MP secondary camera, dual SIM compatibility, 1.2 GHz quad core processor, 8 GB ROM, 1.5 GB RAM, 2600mAh battery capacity and runs on Android v5.1 Lollipop operating system. Shop online for Micromax Canvas XL2 A109 (White) at Rs.4,999 only. Grab it. Buy best selling mobile phones and get up to 60% off on various brands like Samsung, HTC, Micromax, Apple, LG and many more. No coupon required. Don't miss these best deals and offers in mobiles. Get up to 69% on power banks. Designed with a built-in efficient cable, this amazing power bank can conveniently charge your smartphone anytime and anywhere. Shop now and grab the awesome offer. Get up to 20% off on laptop accessories. Select from the best range of Keyboard protectors, mouse pads, extension cords, cables and plugs, and others are some of these accessories. Hurry!! Buy latest mobiles and tablets online and avail up to 65% discount. Get selected products from top brands like Apple, Samsung, HCL, Lenova, iBall, Micromax and more. Buy Apple iPhone smartphones online and avail discounts of up to 40% from Greendust. Hurry! Limited stocks available. Shop for android smartphones, dual SIM mobiles, budget mobiles starting at Rs.3000. Select from a wide range of mobiles from top brands like Apple, HTC, iBall, Intex, Lenovo, Samsung, Sony and much more. Grab the Apple iPhone 6S 16GB (Gold) for Rs. 44999. No coupon code is required for this offer. Buy now! Buy Xccess Pulse A101 online for Rs.3999 only from Syberplace. Also, get free 8 GB memory card worth at Rs.4949. Grab it today! Grab the Xccess Blaze A110 3G in White and Gold color for Rs.4375 only. Get free trolley bag worth at Rs.4750. Buy now! Buy Ambrane power banks online with up to 70% discount. Explore wide range of Power Banks with different capacities and prices. Grab now! Avail up to 42% discount on smartphones. Browse from wide range and buy best smartphone for yourself. Save up to 35% discount on branded mobile phones and tablets such as HTC, Gionee, Apple and more. Shop now and save your money. Buy Apple iPhone 6 - 16GB (Silver) online at Rs. 36,999. No coupon code required. Buy Now! Shop online for iBall Slide Brillante 8GB, Wi-Fi+3G (Special Silver) at Rs. 4,499. Be among the first to get it! Get up to 70% discount on power banks. Shop by top brands like Ambrane, Intex, Mi and more. Don’t miss, Shop now! Subscribe to newsletter with Syberplace and get discount coupon Rs. 100 discount on your order. Hurry up! Syberplace has an exclusive collection of Apple iphones available with up to Rs.36,800 cashback on their shopping. Save up to 80% on mobile and tablets accessories from Syberplace. Shop for cases & covers, screen protectors, chargers, memory cards and many more accessories shown on the page. The Samsung Galaxy S6 Edge 64GB keeps you stunned with a 5.1-inch Super AMOLED Quad HD multi touch display available just at worth Rs.49,999 only. Hurry!! Get flat 40% cashback on all the products with selling price more than Rs. 30,000. All the products below Rs. 30,000. Check out daily deals on mobile phones, tablets, electronics and accessories and get discount of up to 70%. Grab it now! Get up to 70% discount on smartphones. Shop by brands such as Gionee, HTC, LG, Micromax, Motorola, Samsung and more. Buy Now! Pick any mobile of your favorite brand with features according to your need from this latest launched smartphones and get huge discounts of up to 40% on your purchase from this page. Hurry, grab the best one now! Grab the Apple iPhone 6S Plus 64GB (Grey) for Rs. 82,000. Buy now! Get up to 75% discount on best brands tablets. Shop by brands like Micromax, Apple, Dell, Samsung, Lenovo, HP and many more. Don’t miss, Shop now. How about capturing Live pictures? The all-new iPhone 6s enables you to capture moments with motion as well as sound and is available just at worth Rs.65,499 only. Hurry, grab it now! The Samsung Galaxy S6 64GB impresses from the start with a gorgeous 5.1-inch Super AMOLED display with Quad HD resolution (1,440 x 2,560 pixels) leading to a pixel density of 577 ppi available just at Rs.46,999 only. Shop now! Panasonic T10 sports a 3.5-inch HVGA touch Screen display which provides clear visuals even from wide angles worth at just Rs.2,999 only. Grab this phone now!